Other terms apply. See below. From February 15 through February 28, 2011, list your items for free—no Insertion Fees, regardless of the start price of your item. 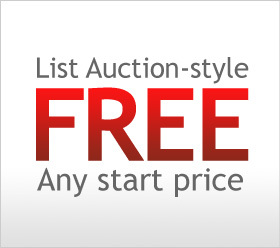 Just list them Auction-style with no reserve price. This promotion has a cap of 50 listings and applies to sellers who do not have an eBay Stores subscription. Additionally, you will pay no fee for adding the Buy It Now option to the Auction-style listings you create during the Promotion Period. There is a limit of 50 listings eligible for this special offer. If you have already sold more than ten (10) items on eBay, your detailed seller ratings (DSRs) must be 4.5 or higher on all four criteria (Communication, Shipping Cost, Shipping Time, and Item as Described) to be eligible for this Promotional Rate. DSR rating criteria for this promotion will be based on the previous 12 months. If buyers have left you DSRs on 10 or more transactions, you'll have access to a Seller Dashboard within My eBay where you can see your current rating. For more information on DSRs, visit the Seller Information Center. New sellers who don't yet have DSR ratings are also eligible. How is this special promotion different from eBay standard fees for Auction-style listings? With eBay standard fees, sellers pay no Insertion Fees for their first 100 Auction-style listings in a month when their starting price is 99¢ or less and there is no reserve price. During this special promotion, qualified sellers pay no Insertion Fees for Auction-style listings which have no reserve price, regardless of start price. There is a limit of 50 listings eligible for this Promotional Rate during the Promotion Period. That's in addition to the limit of 100 listings per month that applies to the eBay standard fees. Please note: listings that start under $1.00 during this Promotional Period will deduct from the 100 standard fees listing cap first. This promotion starts on Tuesday, February 15, 2011, at 00:00:01 PT (12:00 AM plus one second on February 15, 2011) and will end on Monday, February 28, 2011, at 23:59:59 PT (11:59 PM plus 59 seconds) (the "Promotion Period"). For listings on www.ebay.ca, the promotion will begin at 12:00 AM plus one second on Tuesday, February 15, 2011, ET and will end on Monday, February 28, 2011, at 11:59 PM plus 59 seconds ET. During the Promotion Period, Insertion Fees for up to 50 Auction-style listings will be FREE on the U.S. site www.ebay.com, eBay Motors (Parts & Accessories only) www.eBayMotors.com, and eBay Canada www.ebay.ca, as reflected in the fee table below. * Listings created prior to February 15, 2011, which are scheduled to start during the Promotion Period, will be eligible to receive the Promotional Rate. Please note: For sellers listing with any tool other than the latest version of the Sell Your Item form (SYI 3.0), the Promotional Rate will not be shown during the listing process. Instead, the discount will be reflected in the "View Account Status" section in My eBay, as well as in your next invoice. Is there a way I can keep track of how many listings I have left that would be eligible for this special promotion? Yes. You can view this information directly in My eBay and in Selling Manager, and Selling Manager Pro, under "Listing Offers." A separate counter will be displayed specifically for this Promotion. You will see the counters only if you have listed an eligible item during the Promotion Period. * Maximum of 50 listings for this promotion. **Listings with the Buy It Now option must have a Buy It Now price of at least $0.99. Note: All other fees (Final Value Fees and optional feature fees such as Subtitle, Gallery Plus, etc.) will still apply. This promotion does not apply to the following: Sellers who have an eBay Store, Fixed Price listings, eBay Motors Passenger Vehicles, Motorcycles, Boats, Power Sports, Other Vehicles, Motors Local Market, Professional Services, Real Estate, Classified Ad listings. The following business and industrial categories are excluded from the promotion: Tractors & Farm Machinery (91952), Antique Tractors & Equipment (45009), Heavy Equipment (25249), Concession Trailers & Carts (67145), Imaging & Aesthetics Equipment (92036), Forklifts & Other Lifts (97185), Manufacturing Equipment (92080), Metalworking Equipment (92082), and Commercial Printing Presses (26247). The Promotional Rate does not apply to listings with a start date prior to February 15, 2011—including those listings revised during the Promotion Period. Additionally, the Promotional Rate will not apply to listings scheduled to start after the Promotion Period. Listings that have a reserve price are not eligible for this promotion. You will automatically receive the Promotional Rate when you list items Auction-style through Sell Your Item Form, eBay Seller Tools, and most third-party tools.